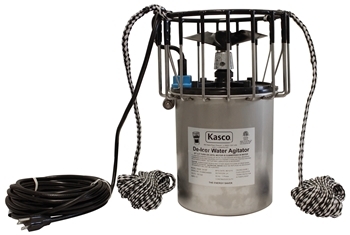 The high-performance motor in the 3400D de-icer creates large amounts of water flow that will prevent ice formation and protect property from the damages of ice jacking and ice expansion pressure. The unit will also allow oxygen to enter the water in the winter providing improved water quality and habitat and helping avoid devastating winterkill of fish. A single 3400D unit can keep a circle of water open up to 75 ft. in diameter. 3400D025 25 ft. 120 1 Optional - C10 or C20 4 ft. 6.7 34 lbs. 3400D050 50 ft. 120 1 Optional - C10 or C20 4 ft. 6.7 34 lbs. 3400D100 100 ft. 120 1 Optional - C10 or C20 4 ft. 6.7 34 lbs. 3400HD050 50 ft. 208-240 1 n\a 4 ft. 3.4 34 lbs. 3400HD100 100 ft. 208-240 1 n\a 4 ft. 3.4 34 lbs.